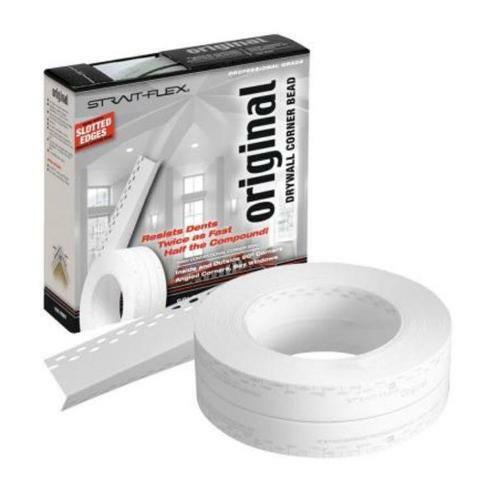 2 3/8 in x 100 ft Strait-Flex Original Drywall Tape at Cowtown Materials, Inc.
Strait-Flex Original is the most versatile, multi-purpose drywall tape from Strait-Flex. 90 degree outside corners, inside corners, and angles can be expertly finished with Strait-Flex Original Corner Bead. Easier to install than metal corner bead; Original resists dents and paint chipping, cuts easily with a utility knife or scissors, is applied with all-purpose joint compound, and will not rust. Manufactured from Strait-Flex's patented composite material, it is extremely strong and will not fuzz-up when sanding.